India's Supreme Court has ruled that the controversial practice of instant triple talaq practised among some Muslims in the country is unconstitutional. The ruling was made after five women petitioned the court, arguing that the practice, which allows a Muslim man to divorce his wife in minutes merely by repeating the word "talaq" (divorce) three times, was a violation of their fundamental rights. 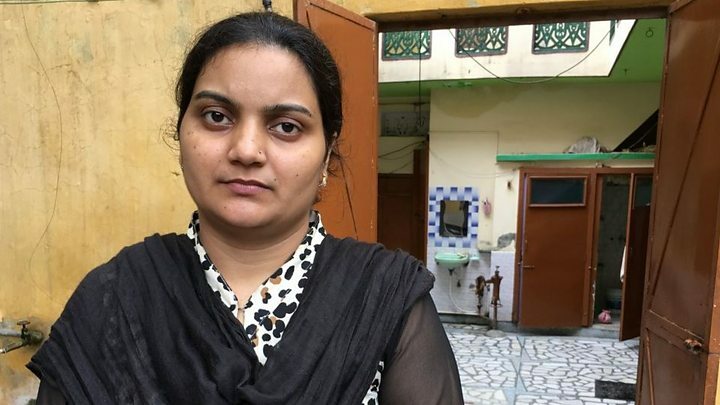 Image caption "I will have to live with stigma all my life, because in India, the woman is always considered responsible for divorce"
When Afreen Rehman, married her lawyer husband in a lavish ceremony in the northern city of Jaipur in 2014, she had an MBA and a lucrative job. She then resigned from her job at his insistence. "I wanted the marriage to work so I agreed," says Ms Rehman. "But it didn't. There were frequent demands for dowry and bouts of violence, I slipped into depression." Within the year, she alleges, she was asked to leave her husband's house. She went to live with her widowed mother. A few months later, she was seriously injured in a car crash that also killed her mother. While she was recovering, her husband sent a note to her sister's house with the words "talaq, talaq, talaq" scribbled on it. "I was shocked. It's a horrible feeling to be left alone without being consulted," she says. "I just didn't know what to do." Ms Rehman's cousin, an activist, encouraged her to approach the courts to annul the talaq and also helped her file dowry harassment and domestic violence charges. Her husband and mother-in-law deny these charges. They were arrested and released on bail four days later. "I will have to live with stigma all my life, because in India, the woman is always considered responsible for divorce," says Ms Rehman. "I don't want to return to my husband - that's not why I'm fighting this case. It's for justice and to ensure other women do not get treated like this." Image caption "I'm a victim but I didn't want that to continue with future generations"
"Instant triple talaq changes the life of a woman forever and destroys her children's future," declares Shayara Bano. Ms Bano was recovering from illness at her parent's home in the northern city of Kashipur in October 2015 when she received a letter from her husband. He had written "I give you talaq" three times on it. That was the end of her 15-year marriage. Her children were at her marital home when the letter came. She alleges that she has not been able to see them since. "I'm a victim but I didn't want that to continue with future generations, that's why I went to the Supreme Court," she says. A local court sent notices to her husband to appear before it and explain why he was refusing Ms Bano access to her children, and put his viewpoint but he has not appeared. She alleged that her husband abused her and wouldn't allow her to leave the house. "My children were the only reason I tolerated it," she says. Her husband remarried in 2016. Ms Bano says she has lost faith in the institution of marriage but is trying to move on. She has also enrolled in an MBA programme so she can find a job and does not want to remarry or see her daughter forced into marriage. "What is the guarantee that another man would not treat me this way?" she asks. She says her daughter should marry only "when she is financially independent". Image caption "If a man wants to marry a second time, he needs to take permission from his first wife"
Ishrat Jahan was heartbroken when her husband called her from Dubai and abruptly ending their marriage of 15 years by simply saying "talaq" three times. He soon remarried. It had been a long and unhappy relationship. Ms Jahan alleges that her husband "insulted and harassed" her for having three daughters and says that he also forced her to have a "physical relationship" with his brother. She had a son in 2014, but she says it was "too late" by then, as he had already made up his mind to marry another woman. Soon after the divorce, Ms Jahan says her husband "kidnapped" the children and took them to live with his second wife. Ms Jahan is illiterate, but knows that "instant triple talaq" is not mentioned in the Koran. "According to the Koran, if a man wants to marry a second time, he needs to take permission from his first wife," she says. She approached the Supreme Court with the help of a local NGO. She has also filed police complaints accusing her husband of domestic violence and his brother of molestation. But, she says, she still wants to reunite with her husband. "And if my husband just does not want to live with me any more, he should say that to me in person, and we can talk about it," she says. "Whatever he decides, he should at least let me keep my children." Image caption "How can talaq be given by one person unilaterally?" Atiya Sabri only found out she had been divorced when her husband sent a letter to her brother's office, in which he had written "talaq, talaq, talaq". "Sharia law says a marriage can take place only when both parties agree, so how can 'talaq' be given by one person unilaterally?" asks Ms Sabri. "He never called or spoke to me about it, that's why I don't accept this divorce." In February, she appealed to the Supreme Court to declare instant triple talaq unconstitutional. Ms Sabri's two-and-a-half-year-old marriage was strained. She alleges that she was "punished" for giving birth to two daughters, and says her husband's family abused and even tried to poison her. She was then "thrown out" of her their home and had to be admitted to hospital, she adds. Soon after, the letter arrived. Ms Sabri complained to the police about the violence. Her husband, who denies the charges, was arrested and is awaiting trial. "A voice within me said if I got scared or gave up, what would happen to my daughters?" she says. "I have to fight for them and win my rights." Gulshan Parveen's family had a hard time finding an educated groom for her. With a Masters in English and a job teaching at a private school, she was among the most qualified women in her town in the northern state of Uttar Pradesh. The man she finally married was less qualified but from a "respectable" family. The marriage did not last. She was often sent to her parents' home for months on end. "She was sent home for six months when she became pregnant and then after the baby was delivered again for eight months - and when she returned, her husband wouldn't give her proper food and would beat her up too," alleges Ms Parveen's brother, Raees. Still, she kept going back to her husband's home because she wanted to make sure her child had a family. The abuse continued but after one incident when he allegedly "beat her with rods", Ms Praveen went to the police. Local elders also intervened and agreements between the couple to "live amicably" were reached. Ms Parveen's husband then submitted a letter to the police declaring he had given her "instant triple talaq". So she appealed to the Supreme Court to restore her conjugal rights. "The only reason she wants to return to her husband is so that her son can grow up in a family. After all how long will I or our parents support her?" Raees says. Muslims are India's largest minority community, with a population of 155 million, and their marriages and divorces are governed by Muslim personal law, ostensibly based on Sharia law. Even though it has been practised for decades, unilateral instant triple talaq is clearly an aberration - it finds no mention in the Sharia or the Koran. Islamic scholars say the Koran clearly spells out how to issue a divorce - it has to be spread over three months, which allows a couple time for reflection and reconciliation. Most Islamic countries, including Pakistan and Bangladesh, have banned instant triple talaq, but it has continued in India until now. And modern technology has made it even easier for unscrupulous men to dump their wives phone, email or text. There have also been instances where men have used Skype, WhatsApp or Facebook for the purpose.